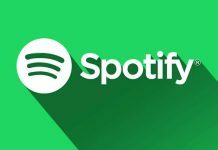 Rumours have been rolling around for the past few days that Spotify might be working on a new hardware product. Earlier today, Spotify said that it will make a news announcement on April 24th in New York. Going by the evidence the company is going to launch a hardware device that can control music in your car. The device is being speculated to be a voice-driven music controller. This would allow drivers to have easy access to play their favourite songs on the streaming platform. 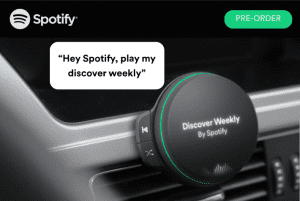 Spotify has already been actively testing voice commands on their app. 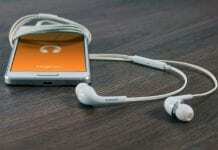 This only makes it more evident that the new device will allow users to control music playback with their voice. The device is expected to have a circular design with actively sporting buttons for track controls and shuffle. The device will also include an LED running around the outside in company’s signature colour, Green. 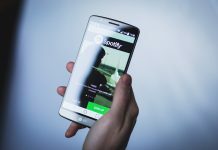 According to reports, several Spotify users in February received an offer inside the app for a new device that would cost them $12.99 per month bundled with the service. The price would include both the streaming service and the device itself if users agreed to 12-month commitment totalling $155. Other users have been reporting that they were offered a price of $14.99 with support for Amazon’s Alexa. Users also claimed that Spotify, showed them a device with 4G capabilities so that the device could function independently. According to the people, the messages are true and legitimate. However, it seems like Spotify rolled out the invites accidentally far ahead of the schedule. The device has also been mentioned on Spotify’s support forums but has received very little attention. Forum administrators have dismissed the request. They said, “We’re always testing things to improve Spotify,”. Right now we don’t have any news on this, but we’ve let the right team know it’s something you’d like to see”.